Kettler rack for weigh tplates and bars - now in black ! 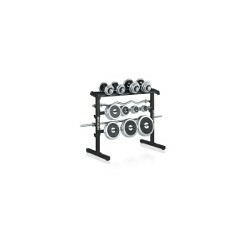 The Kettler dumbbel and weight plates stand is ideal for strength training with free dumbbells/barbells at home. The stand is very sturdy and can be loaded up to 500 kg. Free dumbbell training is the most varied training method for strength training to reach almost all individual training targets. 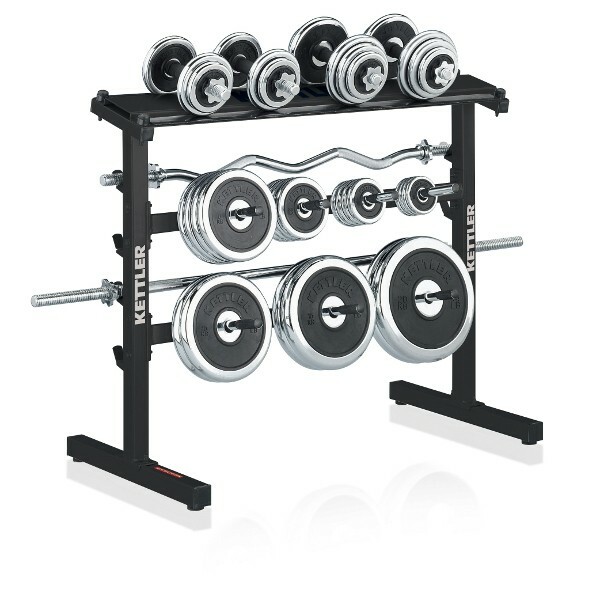 The Kettler dumbbel and weight plates stand offers a lot of space for barbell bars, weight plates, and compact dumbbells and is the optimal accessory for strength training at home. Great product! I'ts very sturdy and the price is affordable. Il prodotto è di ottima fattura, robusto, stabile e resistente. Il kit di montaggio è già incluso, per montarlo ci sono voluti 30 minuti circa. Fa la sua figura ;) Kettler non delude mai. Ein Teil hat gefehlt, aber ansonsten ist es perfekt! El producto cumple totalmente mis espectativas, seblenve resistente y es muy fácil su montaje.